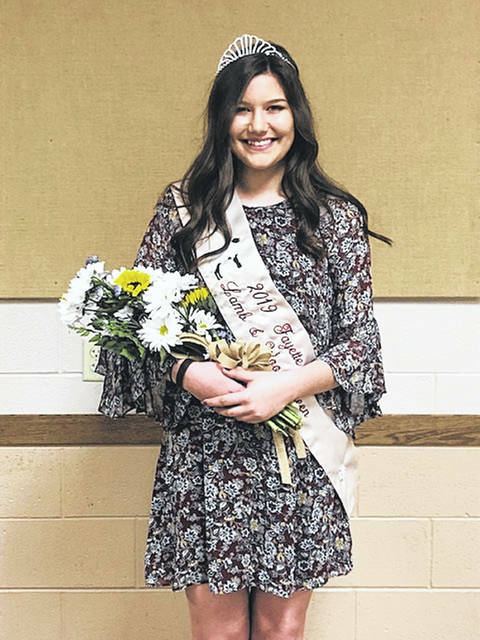 Tapanga Sanderson, daughter of Mark and Traci Sanderson, was selected as the 2019 Fayette County Lamb and Wool Queen during the 79th-annual banquet of the Shepherd’s Club, held recently at the Mahan Building on the Fayette County Fairgrounds. Sanderson is a junior at Miami Trace High School and very active in the sheep industry as well as 4-H.
Abigail Mick, the 2018 queen, performed the crowning for Sanderson. Lydia Ulry, OSU Extension Educator for 4-H and Youth Development, spoke to the crowd of approximately 120 people. Ulry gave her background and expressed her excitement to be in Fayette County and her new adventure as 4-H educator. Abigail spoke of her 2018 reign and the pleasure she experienced representing Fayette County. Shepherd’s Club President Robert Highfield addressed the group after a roast lamb meal, followed by pie and ice cream served by The Willow. Highfield announced the 2019-2020 officers as follows: Robert Highfield, president; Eric Rutherford, vice president; Megan Hicks, secretary; and Bruce McFadden, treasurer. Faith Cottrill and Tabitha Melvin announced the judges, Yvonne Hall and Sharee Houser. Tabitha spoke about the Guys and Gals Lead. She encouraged the youth attending to consider being a participant this year. If you are interested in Guys and Gals Lead, contact Melvin or the senior fair office. Cottrill paid tribute to Johnny Melvin, a huge supporter of the Fayette County Shepherd’s Club, and recalled him attending the banquet every year. His widow, Lavonne, and the Melvin family were recognized. Also recognized were two past Fayette County lamb and wool queens, Carole (Grover) Pontious and Abbi Pettit. Carole Pontious additionally served as the 1993 Ohio Lamb and Wool Queen. Travis Mick, along with Jeremy Etzler, led the drawing of many door prizes assisted by queen Tapanga. The Fayette County Shepherd’s Club would like to thank the donors—Seed Consultants, Fayette County Agricultural Society, Ag Pro, Quali-Tee Design and Beck’s (the ticket sponsor) for the event. Table decorations were by the Fayette County Ag Society. The placemat sponsors were Baxla Tractor, Beford Ford, Buckeye Illini Genetics, Buckeye Propane, Buckley Brothers Feed & Pet Supply, Cottrill Seed Solutions, Diversified Services, Doug Marine Motors, EZ Oil Change, The Farmer’s Pantry, Fayette County Agricultural Society, Fayette County Commissioner Tony Anderson, Gusweiler, Hartley Oil Company, Jim Van Dyke’s Automotive and Tire Center, Mayer Farm Equipment, McDonald & Son, Melvin Farms, MidAmerica Farm Credit, Midland Acres, Pettit’s, Nationwide Insurance John Faris, Parrett Insurance Agency, Prime Meats and Deli, Reiterman Feed & Supply, Seed Consultants, Vallery and Dorn Insurance, and WD Club Lambs. Mick also recognized the 2018 exhibitors by name. Also recognized was Fayette County Travel and Tourism for their support.